Because the world market is increasingly having to accommodate crudes that are heavier and less easy to refine into desirable, profitable products I thought I would revisit my discussion from earlier in the series about the limitation on global oil production, due to the need for suitable refineries to process the oil that is produced, before it can reach and be used by the ultimate customer. I have covered the operations of refineries in the past, but this time I thought I would dwell a little more on some of the factors that relate to the type of oil that is being refined. It is perhaps timely to do so, given that China is moving forward with plans to construct a refinery that will process the heavy Venezuelan crude that, until now, has largely been sent to specialized refineries in the United States that are designed to handle it. In 2008 Venezuela exported 120 kbd of oil to China (out of a total of 1.89 mbd, of which the USA imported 1.19 mbd). This past year the flow to China is reported to have increased to 362 kbd. It might be noted that the recent diplomatic leaks known as the Wikileaks saga has revealed cables that suggest that China was getting some of this oil for $5 a barrel, and then selling it for more on the open market, including possibly to the USA. This could be quite possible since it is also reported that while Venezuela said it exported 460 kbd to China, Chinese figures put the volume this year at 132 kbd. The largest supply of oil remaining in Venezuela is that in the Orinoco Belt, which the USGS has estimated holds a reserve of some 513 billion barrels. (Which, for reference is about twice the size of the Saudi Arabian reported reserve.) The problem with the oil is that it has an API of 9 degrees. Which is where I need to digress a little and explain to those not familiar with the term, what API gravity is, and the significance of a value below 10 degrees. In the following explanation I am going to use a couple of examples taken from “Petroleum Refining in Non-Technical Language” by William Leffler, which has some clear descriptions that I cannot hope to improve on, in explaining some of these issues. If you recognize that the specific gravity of a fluid is the relative density of the fluid when compared with water (at 60 deg F in this case), then you will see that with an S.G. of 1, water has an API gravity of 10 degrees. 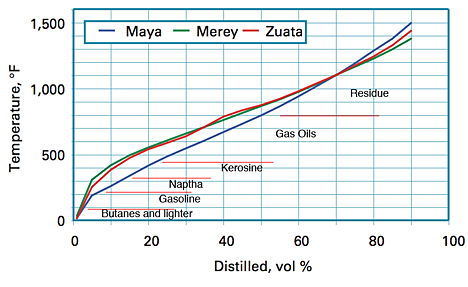 Fluids, such as the Orinoco crude, with an API gravity of 9 degrees, are thus denser than water, and the scale is inversely related to density, so that the higher density fluids such as asphalt, have a lower API gravity (in this case 11 degrees) than lighter fluids such as light crude (36 degrees) and gasoline (60 degrees). The initial separation of the different compounds in the crude is achieved by heating the crude to about 750 degrees F, and feeding the result into a distillation column, where the volatized fractions of the mix can be condensed back out and separated out on trays at different temperature levels. The hydrocarbon content can thus be characterized by the relative levels of fluid that condense out at different temperatures, and the product is known as a Distillation Curve for that crude. For example these are the basic curves for some of the heavy crudes from South America. (Original Source OGJ Nov 18, 2002) I have added the temperature ranges in which the different fractions of the crude would settle out. You can see that, there is not, initially, a lot of the lighter fractions available in these crudes., which are also because of this, more viscous and difficult to move around the plant. To produce those higher fractions the refinery will first remove the lighter fractions, as described above, but then will further heat the remaining crude to the point that the heavier hydrocarbons break down into smaller molecules. Consider the case of the C16H34 Cetane molecule, which will break down into a combination of C8H18 octane molecules; C6H12 hexene molecules and C2H4 (ethylene) molecules roughly in the ratio of 50:38:12. When this happens the volume of the product will also increase. (I am taking this example, and the numbers from Leffler’s text). The density of the original fluid was 7.2 lb/gal, it now breaks down into the smaller molecule hydrocarbons. If we consider the original volume weighed 7.2 lb (1 gal) then 50% of that would become C8H18, which would weigh 3.6 lb. However octane is a lighter hydrocarbon that only weighs 5.9 lb/gallon, so that the resulting volume would occupy (3.6/5.9) 0.61 gallons. In the same way the 38% of the original 7.2 lb would break down into the same weight of C6H12, some 2.7 lb, but hexene has a density of 5.6 lb/gallon. The resulting volume would thus occupy (2.7/5.6) 0.48 gallons. And the third fraction would be the 12% that turns to ethylene, some 0.9 lb that would, at the new density (3.1 lb/gallon) occupy 0.29 gallons. If one adds up the three “cracked” volumes the total is now 1.38 gallons, rather than the original 1 gallon, and this is how “refinery gains” are developed (illustratively) within the refinery. To keep the temperatures down during the cracking process it is generally carried out at a lower pressure than atmospheric, since this allows the fluid to boil at a lower temperature. The heavier the crude then the more complex, and expensive the process of refining becomes. Often even to produce the original crude to the point that it can be pumped long distances, it must first be upgraded to a synthetic crude in an upgrader, located on site. It is this process that the Canadians have found a way to work around, though this is not yet the case with Veneuela. As a result as the different blocks of the Orinoco Basin are being developed, they only come into full production when upgraders have been constructed to handle the flow. Veneuela has contracted with a number of other country partners for production from other parts of the Orinoco Basin. Petrovietnam will help develop Junin Block 2, which is slated to have a production capacity of 200 kbd by the end of this year; Italy’s ENI has a target of 240 kbd starting to come on line in 2013 from Junin Block 5, though the refinery to process this into diesel for Europe won’t be built until 2016; Russia will partner in Junin Block 6 to develop 450 kbd at some unspecified date. In addition a combination of partners are to develop blocks in the Carabobo region, with a total production of 800 lbd, with the production to be on stream by 2013, though upgraders for the crude won’t be ready until 2017. The Chinese involvement has now been approved, with a performance period of 25 years, and further the Chinese have agreed to develop Junin 1 and Junin 8 at 200 kbd each, for a grand total of 800 kbd, which will require a $40 billion investment. Should all the investments that Venezuela envisages come to pass, then they anticipate that the country could be producing 7 mbd by 2021. It is worth noting that the Junin 1 block was supposed initially to be developed by Belarus, but that fell through. However, in a four-party deal, Venezuela has agreed that it would send some of its crude to the USA, if Azerbaijan agreed to send an equivalent amount of its oil to Belarus. Azerbaijan is increasing production and has just reached the 1 mbd mark. Whether Venezuela will reach the levels of production anticipated, or at the rate anticipated, is still, of course some matter of debate, but it does explain where some of the more Cornucopian projections acquire some of their statistics.